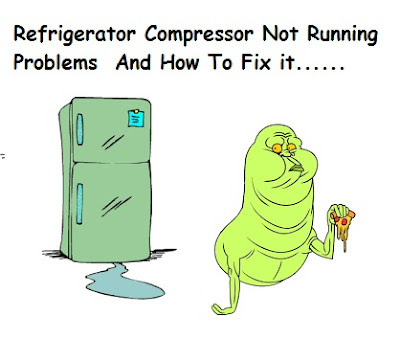 Today i am gonna to to guide you about how to fix refrigerator compressor not running problems, which we mostly face. This is a complete guide of fixing fridge compressor not working or running problems. In this post i am writing about the common problems of refrigerator compressor and how to fix these compressor problems step by step with complete explanation. Mostly compressor or fridge not working in case of no incoming power supply, for this issue first of all check your main distribution board to check breaker from which you get your supply for your refrigerator or for electrical outlet which is in used for your REF. If the breaker is in off or tip state then on it and if still it is trip again then check your supply line, may be a short circuit in your supply. Now if you switch on the breaker and breaker not tripping then check the outlet where your plug in the fridge plug, for testing the outlet (socket) the easiest method is that to plug in the plug of other electrical appliances (i.e example stand fan, set the knob of multi meter for testing AC voltage and insert the meter testing leads to the outlet.) Now if outlet have not receiving the power supply then change the outlet or fix the outlet problem. For that call a professional and if you can do this him self then do it but carefully. Here some posts which help you about outlets connection. How to wire Electrical Outlets? What is PTC Relay and How it's works? What is working of Overload Protector? How to check compressor winding? Then next common problem of compressor not starting is that " your fridge supply wire will be cut internally", in this case your refrigerator all machinery will not work, the cooling fan, light etc. Note that in above electrical supply problem the refrigerator will same problem and other devices cooling fan , light etc will not working too. The other common reason of compressor not running is that your fan internally light will be glowing but your compressor will not working, for that i suggest you test first of all the internally thermostat that refrigerator thermostat is working or not working, As you know that thermostat is connected in series with compressor and supply goes through the thermostat, now if thermostat is stop working and making a open connection then how can the electrical supply will run to compressor. For that fix the refrigerator thermostat or change it. In some cases, some one or mostly children move the thermostat knob on switching off direction, so first of all chick the thermostat switch and if this on off direction then change the direction of thermostat knob. One thing more that we use thermostat switch for regulating the temperature and if your compressor start only for some time and before to make ice , compressor is switch off, so in this case your refrigerator thermostat switch is on low cooling , for that do setting of your refrigerator thermostat for high cooling. So test thermal overload protector by using the multi meter and if thermal overload have connectivity between two points then your thermal overload is working and have no internal problem but if the thermal overload is internally open then change it. (Note that when thermal overload temperature is high it's make an open circuit, so the best method is to cool the thermal overload protector and when it's cool test it by using the multi meter. PTC Relay is the main part which start the fridge compressor, When ptc relay stop working the compressor also stop running. So if your PTC (positive temperature coefficient thermistor) relay is not working or burn then change with same type of relay. Capacitor is also one of the reason of refrigerator compressor not running. Some time we use capacitor with capacitor start relay which make a strong starting current for starting compressor. There are two types of capacitor which we use with refrigerator compressor with relay which are starting capacitor and running capacitor. And if capacitor not working then change capacitor with same type of capacitor. Voltage is also one of reason of which make refrigerator compressor not running, so use a voltage regulator or voltage steplizer to provide the same ratio voltage which compressor need to start. I hope this article help you fix refrigerator compressor not running problems, however if you have still face any fridge compressor not running or working problem then you can ask in below comments section.